Come One, Come All To The Maker Faire! It’s crunch week, as organizers get ready for Saturday’s 4th annual Mini Maker Faire. 6,000 attendees are expected at Connecticut’s largest event focused on creativity and innovation. Naturally, you can expect the unexpected. Like a Human Foosball table, a Nerdy Derby (Pinewood Derby with no rules), and Marshamllow Shooters. It takes human beings to design and make a Human Foosball Table. 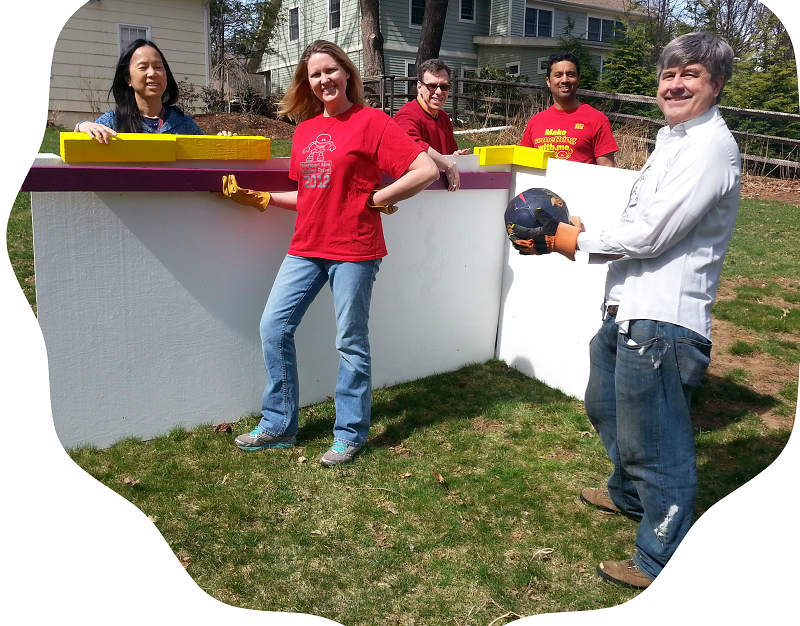 Hard at work last weekend were (from left) Cecilia Fung, Kerstin Rao, Michael Miller, Vijay Rao and Jeff Boak. The event has quickly become a highlight on Westport’s annual calendar. Over 100 “Maker” exhibitors — specializing in arts and crafts, science and engineering, robots and rockets, electric cars, boats, sustainable living, even puppets — will open their arms to anyone who likes to tinker (or hang out with those who do). It’s a family friendly day — meaning (of course) there’s food and music too. Need another reason to go? If you register for free tickets online (to help make sure there’s enough “stuff” for everyone) — and bring your printed-out ticket to the Maker Faire — you’ll be entered in a contest to win a 3D printer. You were expecting maybe a gift certificate? How un-Faire. The Mini Maker Faire is this Saturday (April 25, 10 a.m.-4 p.m.) at Jesup Green and the Westport Library. Click here for more information. This entry was posted in Library, Organizations, technology and tagged Westport Mini Maker Faire. Bookmark the permalink. This senior citizen thought this was awesome last year. Support our favorite local small business from Riverside Ave! Junior’s Deli and Grille will have their Catering Food Truck there. Enjoy his great menu. He was a hit at “Touch a Truck” a couple of weeks ago. You can look him up on Facebook under Junior’s Deli and Grille Westport, CT. It want something before 10am his staff is at 265 Riverside Ave from 8am to 3pm serving breaksfast and lunch. 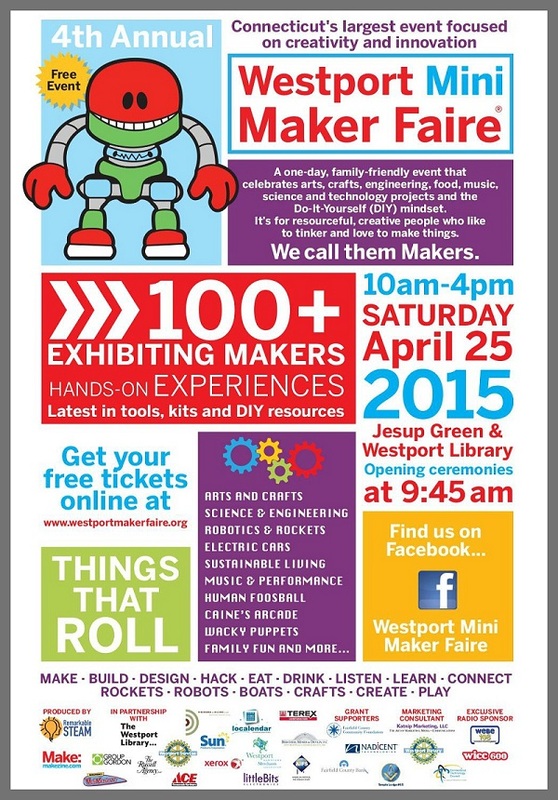 Enjoy and Have Fun at the Westport Mini Maker Faire this Weekend.